A very special hello and a big thank you to everyone who has subscribed to my newsletter through my website All-About-Cupcakes. Every month I am seeing huge increases in traffic so thank you to all of you that have visited and been inspired by my site. I would love you to send in recipes or photos (or both) so that we can all share in your successes. This month’s edition of Cupcake Corner concentrates on a very special day on the calendar – Valentine’s Day. Special for some, that is!! My husband tells me every year that it is a commercial con that was started by greeting card companies in order for them to gain extra sales. He should not have to be told when to buy me flowers and chocolates. Every year I wonder what it would be like to be married to someone a little more romantic!!! Despite his protestations, this year I will be making a cupcake bouquet. If you haven’t seen one before it is a gorgeous bouquet made from cupcakes and it is quite easy to make. You can either attach all the cupcakes in place and then frost with a buttercream frosting or frost before placing on the Styrofoam ball. I prefer the latter as I can then place the cupcakes in the refrigerator so that the frosting sets completing before attaching the cupcakes. If you make a cupcake bouquest on a warm day, the frosting may slide off the cupcakes if not completely set. I use a star tipped nozzle and start at the edge of the cupcake piping the frosting in circles until I reach the middle. 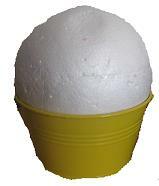 The Styrofoam ball needs to fit snugly into your choice of bowl, bucket or flower pot. I would recommend using a well weighted pot or bucket. If needed, glue or tape ball into place. Place a toothpick in the Styrofoam ball near the bottom above the rim of the bowl. Place a cupcake on the toothpick in the middle. Half of the cupcake should be above the rim of the decorative bowl and the other half below the rim of the decorative bowl. Using another toothpick, place the next cupcake to the left of the cupcake so they are touching. Continue adding cupcakes around the entire rim of the decorative bowl. Start the next row by placing a toothpick in the Styrofoam above the first row then add a cupcake so they are touching. Continue adding cupcakes row by row to the left, until the entire Styrofoam ball is covered. Make sure all the cupcakes are touching, there should not any space between the rows. Fill any gaps with artificial leaves or tissue/cellophane. Because I made the cupcake bouquet (pictured) on a warm day, I needed to place it in the refrigerator until I was ready to serve it. I made 50 mini cupcakes to cover the styrofoam ball. 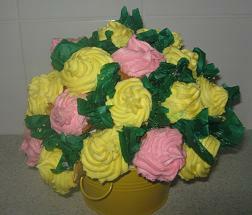 I made this cupcake bouquet in yellow and pinks. It would look gorgeous in red and white - perfect for Valentine's Day. If you don’t have the time to make a cupcake bouquet (or you don’t need that many cupcakes) - one single boxed cupcake is a gorgeous gift idea. There are so many fantastic boxes, either in cardboard or clear plastic, available through the shops that will make the cupcake look really special. 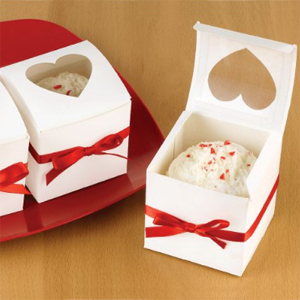 These individual cupcakes in a cupcake favor box with a heart window are iced in white buttercream frosting and topped with red edible glitter. Easy to make but they have a real WOW factor! Have you seen cupcake wrappers (pictured above) in the shops? They seem to available everywhere these days. They are laser-cut cardboard that fit neatly around your cupcakes. They really dress them up. This cupcake has a white buttercream frosting and then topped with red heart-shaped sprinkles. This cupcake would look spectacular packaged in a clear plastic favor box. Fondant is very useful at this time of the year. Another decorating idea is to top cupcakes with fondant hearts. Colored fondant is available in the supermarkets. Roll out to desired thickness and then cut out heart shapes. You can either use fondant to cover the cupcakes or you can use a glace or buttercream frosting. If you still have some candy canes left over from Christmas, peel the plastic wrap away from two candy canes and you have a heart! For best results, heat the oven to 175C/350F. Place two candy canes together, facing each other and put in the oven for 2-3 minutes. By doing this the candy canes will melt slightly and fuse together. They look really effective. A really popular recipe for Valentine's Day is Red Velvet Cupcakes. 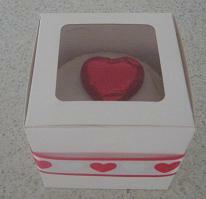 Frost with a buttercream frosting or cream cheese frosting and top with a heart shaped chocolate. If you are still a bit unsure about decorating Valentine’s Day cupcakes, take a stroll along the confectionary aisle of your local supermarket. 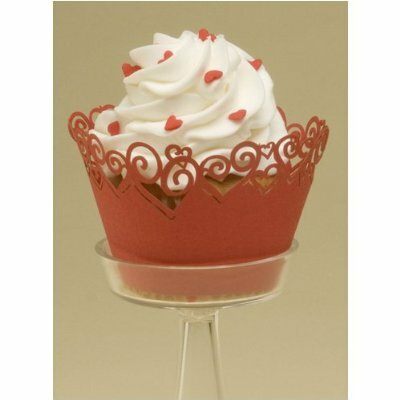 You will be inspired by heart-shaped candies and red and white sweets that can be used as cupcake toppers. I would like to thank Florence for sending in her favourite cupcake recipe. I love receiving your recipes and sharing them with my readers. Your recipe for Cherry Tassies sounds fantastic and I will be trying them very soon. Thanks also to Maree for sending in a recipe for Beef Jerky Pupcakes I have really loved building my website and I have so much more to add. I would love you to join the fun with me and add your own content. In other words, you can not only read the recipes, tips and reviews on the site, but you can get involved - sharing your foodie knowledge with the rest of us! If you have a cupcake recipe to share, or you want to comment on other readers' favorites, you can - quickly and easily. We also love to see photos of your cupcake creations or you can share a story that goes with your cupcake designs. I hope you get some inspiration from this edition of Cupcake Corner. I would love to hear from you as to what you would like included in future editions. Until then happy baking, making and decorating.